A friend told me that the jump from two kids to three will be a big one and you will suddenly be overwhelmed by all the things you need to do, only to realise that you do not have enough hands, time and energy. A second friend contradicted the view and said that the change from two to three is not as bad as from one to two because you have already gotten used to the sibling rivalry, the demand for attention, the endless whining and the display of classic tantrums. 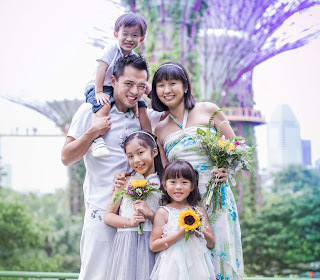 A third friend said that while a stay-at-home mum is able to juggle both the home and the kids when she is a mum of two, she will need to engage a helper or get some sort of help when she becomes a mum of three. I kind of understand it all now and think there's some truth in all of these statements. January has been quite an exhausting month for me as I get used to the early morning routine of having to prepare breakfast and bring Angel to her primary school, having to juggle the needs of all three kids, having to deal with additional chores, having to handle a newborn, having to be sensitive to my elder two, having to try my best to carry on life as per normal and assure everyone that things are going to be okay, if not better. Some people still think that I have it all together and some might naively think that it's all rainbows and unicorns for us. Those who have been through it will know better. No matter how many happy, blissful, perfect moments I post on Facebook and Instagram, the truth is there are days that are frustrating, moments that are painful and times when I need to remind myself to breathe and find strength to brace myself for whatever lies ahead. No, it's never about just unicorns or rainbows or puppies or butterflies. Motherhood has never been and will never be smooth but that's where the beauty of it lies. For us to fall and to pick ourselves up, for us to survive tough times and emerge stronger, for us to see the hope, love, joy that lies within and realise how we need to treasure every moment, be it good or bad. So, life has been a whirlwind and we are constantly in a state of chaos. 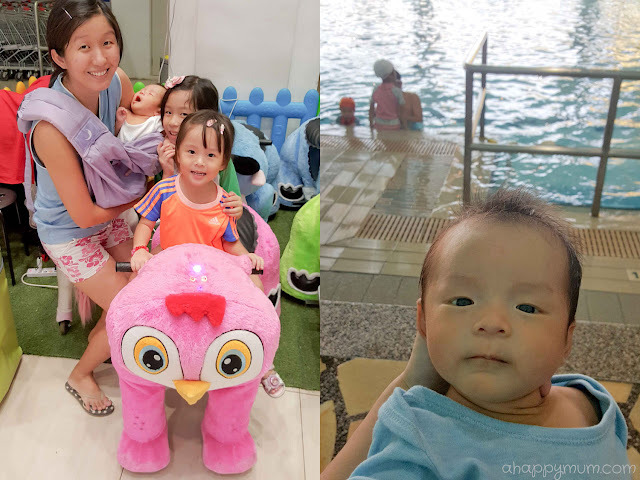 In January's "Happiness is...", I share with you on how I remind myself that it's all about getting used to it. So you probably already know that I didn't really have a strict 'confinement' because since the day I was discharged from the hospital, I was up and out. I have to be very thankful for being able to have a smooth, natural delivery and a body which bounced back into shape pretty fast, enabling me to be able to bring my girls out, fetch them from school and carry on with our family weekends. I'm also very lucky to have my in-laws cook our meals for us this month and the hubby was also around to help for a couple of weeks while we adjusted to the new lifestyle. To help Angel celebrate having survived the first week of primary school, we went to a funfair and let them have fun on the rides and games. I keep reminding myself that someday, which might be soon, they will outgrow these kiddy stuff and no longer find the joy in carousels, inflatable castles or fishing for rubber ducks. So while it lasts, I'm really gonna cherish these moments. We also brought them out to parks for fresh air, for some fun in the sand, to play on the swings, to feed the fish or just have an ice cream or two. It's like we did nothing but yet everything, you know what I mean? Right, since we are such avid moviegoers and there were a few shows that we wanted to catch, we decided to bring the baby too. At one month old, he has watched Alvin and The Chipmunks: The Road Chip, Ip Man 3 and The 5th Wave. Some people might really think this is unhealthy but to us, there wasn't much harm because we always chose the backseats and I made sure his ears were covered. At this age, he usually drinks milk and sleeps so as long as he is warm and snug in my arms, I think we will be okay. Plus, it's not really fair to deprive the elder two just because we have a newborn, right? 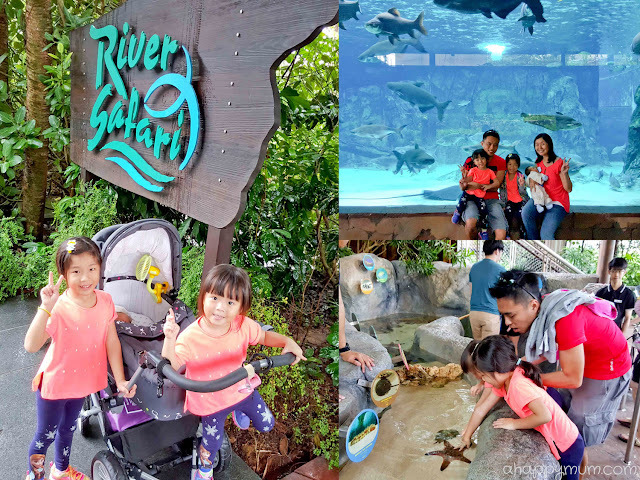 Last month, I brought the girls to River Safari on my own when I still had a baby bump. This month, we went there again on the second day of 2016 when the baby was 12 days old. Yup, we are now officially a family of five! It all felt so surreal to me and my mind would always flash back to the day that I gave birth and my little prince arrived in this world. How does time pass by so quickly? It's going to be quite challenging to keep up with Creativity 521 but I'll see how it goes. Meanwhile, I still like to let the girls get creative when we have some time at home. On another note, lessons at heART Studio have resumed for Angel this month, plus Ariel went for her first class too! And to my relief, she seems to enjoy it too! Woohoo! I'll share more of what she did in another post soon! For the big girl, I'm glad to see that she is settling down well in school and made some good friends too. It's still quite tricky having to wake her up so early in the mornings and make her go to bed early at night but we're trying our best and taking it one step at a time. For now, I'm so thankful that her school is within a 15-min walking distance from our house because that means more precious sleep time for everyone! As much as I can, I also try to resume our routine like going grocery shopping at the supermarket, visiting the library or going for swimming which they love so much. Honestly, I am quite eager to get back into the water and have a dip with my girls! Patience, patience. Meanwhile, thanks to the hubby for accompanying them for the time being while I wait for the bleeding to stop and look after the baby. We also visited the newest shopping mall in Singapore not once, but twice in a month! Yes, despite the crowd and the full carpark. The first time, we had lunch with my parents and also checked out Wonderland. The second time, we did CNY shopping! I'm so happy that there's a H&M outlet here because it's our favourite place to shop ever since our days in Sweden. Playgrounds and more playgrounds! 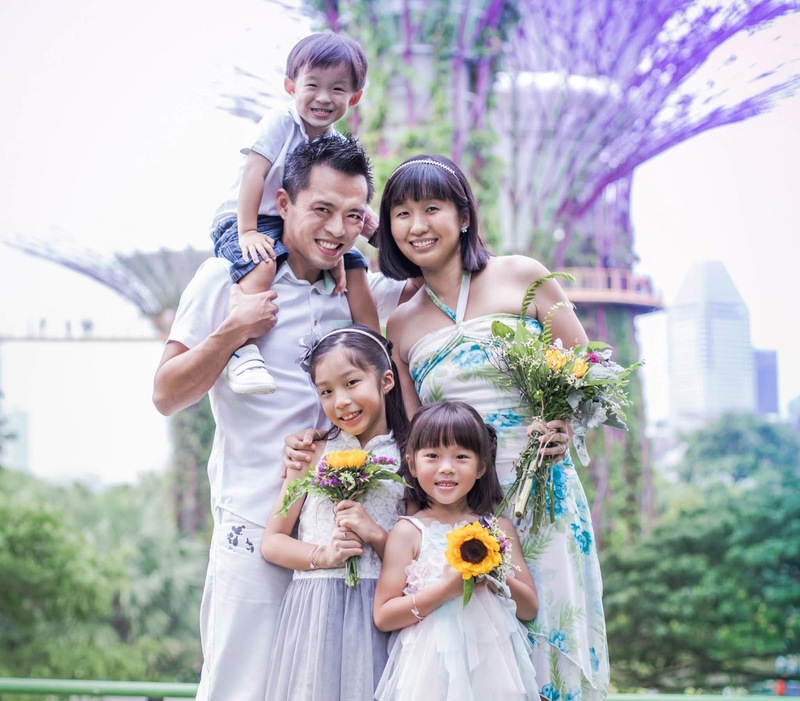 Sometimes when we feel too cooped up at home, I'd rather bring the whole brood out. Like I said before, at home, I am the one who has to entertain them. When we are out, they have the world. They explore their surroundings, they get up close with nature, they observe passers-by, they play with other kids and as ironic as it sounds, going out gives me a chance to have some peace and quiet. Even if it doesn't last long. That said, it is a little challenging bringing all three out on my own and for now, I'm feeling thankful for our sturdy Emmaljunga pram from Sweden (we have a kiddy board too) and my trusty Baba Sling in which the baby is happy to sleep in. In the blink of an eye, the baby has also turned full month and we held a simple but joyous celebration for our little one. Once again, I was reminded of how fast these kids grow and I can only try my utmost to cherish these years and make every day count. The girls are also loving the new addition to our family and can't help hugging, cuddling or kissing him. The moment he cries, they will also run up to him, try to soothe him or sing a lullaby for him. At times, they forget to be gentle with him and will pull his hand a little too forcefully, jump on the sofa when he is sleeping, sing too loudly when he is beside and so on. 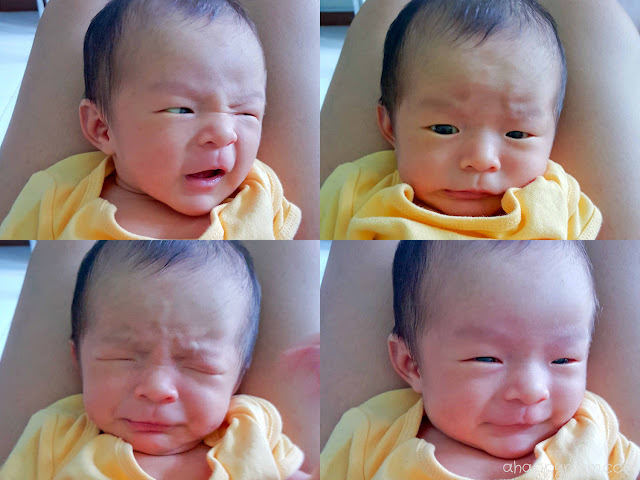 Many a time, it frustrates me and the hubby because we took a long while and put in a lot of effort to make him sleep (he wakes up very easily, this baby); but a simple movement or a shout from the girls will just ruin everything. Yet, they do not mean any harm and all they have is pure love for their little brother. So, I just have to be more patient in teaching them. As for the baby, he's just a total joy to be with. Obviously, he keeps me awake most of the night and either he poos, asks for milk or just demands to be carried. Nonetheless, the sleep-deprived me is still thankful with every beat of my heart to have him. Oh, babies, I just can't seem to get enough of them! Here are the girls, all worn out after cycling and scooting on a Saturday afternoon. I thought this picture pretty well sums up how I feel at the end of the first month of 2016 - tired but happy. Our house will probably continue to be messy, our lives will be quite chaotic and the mayhem looks like it's here to stay. All I can say is, it just needs some getting used to and we are slowly but surely getting there. How did January go for you? P.S. Starting 2016, while "Happiness is..." series will continue on the blog, it will cease to be a linky party. I still hope to share my monthly thoughts and happenings because writing and thinking back helps me to put things in perspective and see the bigger picture in life. So, let's keep it up! Kids jumping on sofa when baby is asleep! Haha I can identify with that!! You are doing so well, Summer. I can feel your tiredness by looking at this post. Was just telling my husband that baby times really do pass by so quickly. So we all gathered together and watched the kids' baby videos. Keep up your videos; they will be so precious for your little ones! !